Combine prints of the same shape or colour. Combine prints of differing sizes. The skirt and shirt outfit (pictured right) adheres to both these rules. 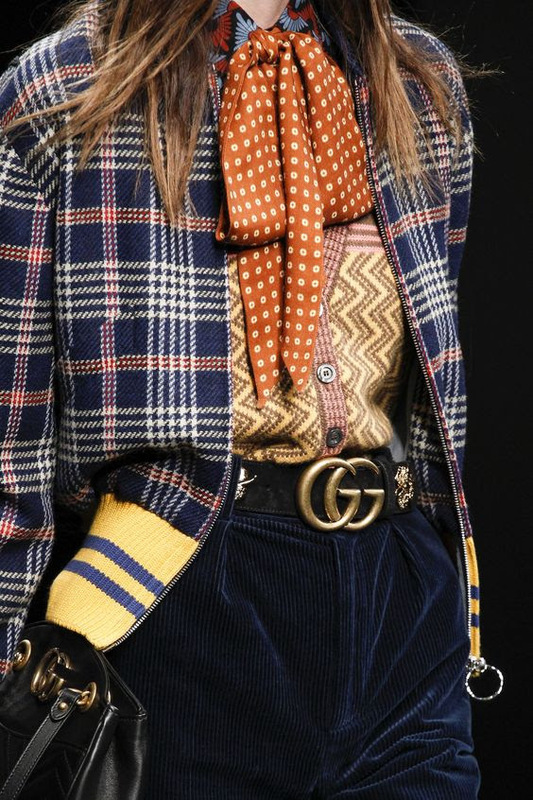 If you’re more of a classic than a creative dresser, you will probably be most comfortable combining a small print which looks almost like a unicolour with a larger print. This makes for an interesting and harmonious combination. For novices to mixing different prints, combining stripes with spots or florals can also be a good starting point, especially if you separate them with a block colour. You could, for example try a striped skirt, such as the one pictured, with a plain top and a spotted or floral scarf. Dramatic or creative style personalities will enjoy more daring combinations such as this check jacket, zig-zag blouse and spotty necktie. Here, once again, the principle of a connecting colour and different sizes of print unifies the look. As well as adding interest and personality to an outfit, prints can be used to camouflage and highlight. A dense, all-over print will help to disguise lumps and bumps whereas a placement print, ie one that is sparse and bold, is great for highlighting areas of your body you’re particularly proud of. At the very least, think about investing in some patterned scarves in your best colours. Not only will they cast a flattering light on your face and add interest to whatever you’re wearing, they’ll also keep you warm this Winter! This entry was posted in Blog and tagged Autumn style, clothes, personal style, Winter style. Bookmark the permalink.